The two-day Candlelight Reception in early December returns the Garfield Inn to the 19th century for a celebration of the holidays. Interpreters wearing period clothing share with guests what life was like for people during the height of the horse and wagon era. There is no charge for the Candlelight event, but donations are most welcome. 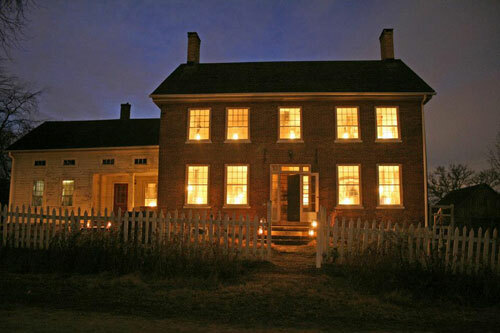 Candlelight has always been one of the most popular events at this 1840s farm and tavern museum. It evokes a pace and peace that is so foreign to life today. It requires a conscious effort on the part of the modern day visitor to linger and savor the experience, to strike up a conversation with others, and enjoy what was once a great luxury: a brightly lit home full of travelers and neighbors, making for a most jovial atmosphere on a winter's night. 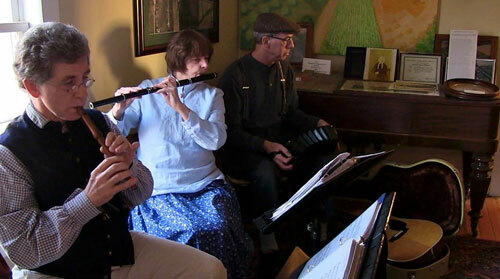 Dulcimer music by the Scantlin‚ Reunion and friends is played in the ballroom and refreshments will be offered in the inn's dining room. The Garfield's Inn sat on the junction of the St. Charles-Oregon and Sycamore Roads. At the time, a heavily loaded team of horses with good weather could only travel about 15 miles a day. Inns were busy places that offered weary travelers an occasion to take a break from the monotony of their journey. A guest of the Garfield's could eat, sleep and most importantly talk to others. News traveled slowly and travelers provided news from far and near, as well as telling entertaining stories. Inns became a center for the community hosting dances, militia drills, weddings, “donation” parties for local clergy, political meetings, and other functions. Following a visit to the 1846 inn, walk up the glowing lantern path to the Burr House and enjoy even more, as the museum will feature a hearthside cooking demonstration. Learn how the early settlers used to cook their food on a hearth and bake their bread in a brick oven. There will also be a bake sale with items made by the museum's own volunteers. The Candlelight tour offers visitors a chance to meet the volunteers and donors, who are the lifeblood of the farm. The event is a time for those interested in becoming involved to meet those who already give so much to help sustain the museum and keep it moving forward. The event also benefits the museum's ongoing efforts to restore the historic buildings and to provide educational programming.